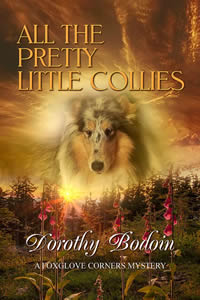 An unknown villain seeks to harm the collies of Foxglove Corners by tossing poisoned meat in their yards. In the meantime, a young girl receives threatening notes directing her to withdraw her blue merle collie, Sparkle, from dog show competition--or else. The collies saw it first, a thick chunk of meat, red and glistening against the green grass that grew on Sue Appleton’s horse ranch. It was impossible to miss seeing it or hearing the buzz of flies in the afternoon silence. The dogs, noses to their disgusting find, didn’t look up. Icy’s tail was wagging. I broke into a run. I had to reach them in time. I did. At least I hoped I was in time and they hadn’t taken a bite of the meat. How long had it been lying in the grass, an irresistible temptation to an ever-hungry canine? Had Scarlet or Icy passed the initial investigation stage? A drop of drool hung from Icy’s mouth. I swatted the flies away. What if the meat were poisoned? Certainly it might be spoiled, depending on how long it had been exposed to the hot May sun. Ignoring my disgust, I reached for it. Scarlet, bred and raised at the renowned Silverhedge Collie Kennel--in other words, not my dog--gave a warning growl while Icy, seeing his prize snatched away raised his lips to expose sharp, white teeth. Collies, deprived of a coveted treat, lose all semblance to the gentle Lassie. “You two--in the house!” I turned away from the angry dogs to search the meadow that separated Sue’s ranch house from the woods. I should see five more collies running through the grass and wildflowers. I saw two, Echo and the blue merle, Bluebell. Where were Tara, Reddy, and Quincy? I called them and rolled up my sleeves, conscious of the increasing heat. I’d volunteered to take care of Sue’s collies in her brief absence, sharing the responsibility with Emma Brock and Ronda Leigh, fellow members of the Lakeville Collie Rescue League, well aware of how much time and effort would be involved. I hadn’t counted on suspicious meat or recalcitrant collies, though. I waited. Bluebell and Echo were already at the back door. Presently Scarlet appeared. She sniffed the ground, her mouth still wet from the dripping meat. Quincy dashed up to Scarlet, his favorite, and executed an endearing play bow while Reddy looked on. But play time was over. Holding the dripping roast away from my green linen dress, I led the way to the house, counting collies to be sure I had all seven. In Sue’s kitchen I found a plastic bag large enough for the meat, then dropped it inside and pulled the slider shut. That done, I washed my hands thoroughly, passed out treats, and filled water bowls. I was done. Emma would take the last shift, which reminded me. I had to warn her. Hastily I wrote a note telling her about the meat and cautioning her to be on the lookout for anything that didn’t belong on the property when she let the collies outside. Jonquil Lane is one of the most beautiful roads in the little town of Foxglove Corners. In the spring, yellow jonquils, daffodils, and tulips bloom along its winding verge, providing bright contrast for the last two houses on the lane: my green Victorian farmhouse with its gable-bracketed stained glass windows and the grand yellow Victorian in its surround of old-fashioned flower gardens. My husband, Crane, was home from his long patrol of the roads and by-roads of Foxglove Corners. I parked behind his Jeep and listened to the raucous welcome-home barking of my own collie brood. They were gathered in the kitchen on the other side of the door, ready to engulf me in wagging tails, waving paws, and cold noses. Candy, my chief mischief maker, licked her chops. She had spied the plastic bag in my hand. Misty, the white collie, was close behind her. Halley and Star, the matrons of the pack, waited patiently to be acknowledged along with the others, timid Sky, Gemmy, and Raven. Yes I had seven collies of my own. Crane stood at the sink, drying a wet mug. He hadn’t changed out of his uniform yet, but that was all right. He looked handsome, tall and impressive in his tan deputy sheriff’s uniform with its shining badge and his gun still strapped to his waist. I stashed the meat on the counter as far back as possible. “It might have been poisoned,” I said and told him about finding it on Sue’s property and whisking it away from Icy and Scarlet. “I’ll have it tested,” he said. Camille was my good friend and aunt by marriage who lived across the lane in the yellow Victorian with her husband, Gilbert. She had two dogs and took care of our brood while I taught English at Marston High School and Crane patrolled the roads. I hoped I’d be able to eat. The memory of that hunk of beef rotting in the sun was as vivid in my mind as it had been lying on the lush green grass. What if Sue’s precious collies had torn into it before I reached them? Suppose they died and on my watch? It didn’t happen. Don’t think about it. Thankful that the stew was cooked and I didn’t have to deal with raw meat, I brought the flour out of the cupboard. Candy placed her paws daintily on the counter, nudging the canister with her long nose, poised to catch whatever tidbit might fall to the floor. She struck the canister with her paw. Just in case I hadn’t understood her hint. The collies could be so silly at times. They were like children, needing constant watching. I would do anything in my power to protect them. After dinner I crossed the lane to tell Camille about my experience. We sat in her blue and white country kitchen with Twister, the Belgian shepherd, and Holly, the black collie, who had to make sure we were only having tea and not one of Camille’s homemade muffins or coffeecakes. The last rays of the sun struck the collection of cobalt glasses on the windowsill and turned Camille’s honey-blonde hair to silver. She was the first friend I’d made in Foxglove Corners, and we’d sorted through many a problem in this room. She smiled at the remembrance, the pride evident in her voice. This was typical of the kind of stories we all tell about our dogs, each one trying to outdo the other. “I hope the dognappers aren’t back,” she added. A band of dastardly dog thieves had descended on us during my first winter in Foxglove Corners, ultimately posing a threat to people as well as their pets. They were cunning and without scruples. Our safe little corner of Michigan wouldn’t be safe any longer if their kind had returned. “This may be an isolated incident,” I said. The president of our Rescue League, Sue led a relatively quiet life on her horse ranch, giving riding lessons to a group of young equestrians and caring for her dogs. I couldn’t imagine Sue with an enemy either. But one never knew. Perhaps the owner of a collie she’d rescued resented her interference. That seemed unlikely. People who surrender their dogs rarely look back. A dog thief, on the other hand, might drop a piece of meat laced with a tranquilizer and stand by waiting to scoop up the unfortunate dog who took the bait. I hadn’t seen anyone loitering near the horse ranch. “That’s all we can do,” I said. Take a walk through Foxglove Corners and look at my cozy mystery series featuring Jennet Greenway and her collie, Halley.